Dog training equipment covers a wide range of items used to teach your dog specific behaviors, whether for at-home use or in the competition ring. These basic pieces of training equipment are the bare essentials needed for most types of dog training. Dog collars come in several styles, each suited to a particular type of training or activity. Buckle collars are suitable for the average walk. Choker chains and prong collars offer a greater amount of control over uncooperative pets and are generally used in obedience training. Electronic dog collars serve different functions and can be used to stop nuisance barking or train dogs to use invisible fencing. Leashes also come in varieties designed to serve a specific purpose. Standard leashes may be used for any training but are not ideal for all. Materials include nylon, and leather, and some styles are also available in a retractable unit. Nylon show leads such as Martingales come with a slim collar attached that can be adjusted for a customized fit. The follow equipment is all used when training your dog for obedience. Utility training involves a lot of scent discrimination, teaching your dog to identify and retrieve a specific item from a field of similar decoys. The following items are necessary to this training. Utility articles are an assortment of dumbell-like objects used in the scent discrimination exercise. Gloves are used to keep other scents from being transferred to the utility articles. A utility mat is used as the base under the utility articles. For early training, the decoy articles may be tied to the mat to discourage the dog from selecting them, helping him to focus on detecting the correct item by scent. An article bag is used to transport and store utility articles. The list of agility dog training equipment is a long one, comprising a literal playground of obstacles/stations, including weaves poles, jumps and much more. For a list of obstacles, complete with descriptions and where you can purchase them, read our article on Dog Agility.In addition to the obstacles, a stopwatch, or electronic timer is also necessary to track the time it takes for your dog to complete the agility course, a key element to this sport. The equipment for dog clicker training is quite simple really, just a clicker device is needed, along with a clicker training manual if you aren't already familiar with this training method that uses the sound of the clicker to help your dog immediately associate a desired behavior with his actions. 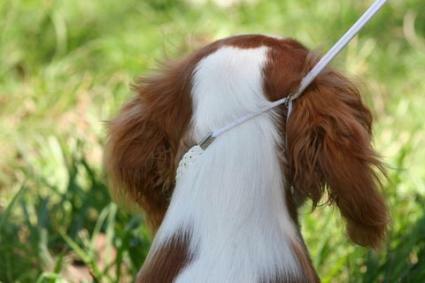 A show lead is a speciailzed type of leash that has an adjustable slip collar built right into the end of the lead. Rubber matting can be used at home to accustom your canine to the look and feel of the show mats, making him more relaxed in the show ring. Show gates are flexible fencing that surrounds each show ring. Again, the more you get your dog used to this common dog show feature, the more he'll focus on both his handler and giving his best performance in the ring. Training isn't all leashes and obstacles. Knowing what you need to train your pet to do and how to train him to do it competently is a part of the game too. The internet is your best source for printed and visual training aids that can give an overview of rules and requirements for competitions, plus plenty of tips to help you teach your dog what he needs to know. Once you develop your own training skills, you'll be ready to go to work on your dog's skills next. As with most situations in life, dog training requires the right tools to get the job done, and the dog training equipment discussed in this article can provide the additional help you need to accomplish many of your training goals. If you are interested in one of the dozens of other ways to train your dog not already covered here, including hunting/retrieving work, and schutzhund training, don't hesitate to use an internet search to find all the equipment you'll ever need. However, keep in mind that some equipment is of better quality than others, so if you are unfamiliar with a brand name, you may be better off going to a local store where you can actually examine the items before you purchase them. You'll find plenty of dog training equipment at the following online stores.